A high performance storage solution featuring ultra-fast Thunderbolt and USB 3.0 interfaces in an all aluminum enclosure. G-DRIVE with Thunderbolt is perfect for storage-intensive applications like audio/video editing, digital photography and data backup. 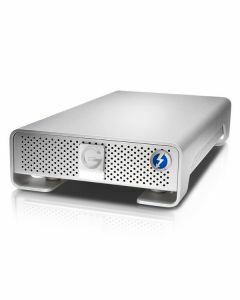 Available in storage capacities up to 6TB, G-DRIVE with Thunderbolt is plug and play on Mac OS, and easily reformatted for Windows.